@ NT Badlapur's NE is dark with thundering from last 10mins and slight winds also from NE side.. Hoping to arrive that patch in Badlapur too ! Still Badlapur's west side is totally clear..
@ NT. Yes it's just drizzling in Badlapur. And see Vagaries FB for mine snap that how moon is visible in between black clouds in East side.. That indicating storm fading away here !! As I am looking at that storm that Junaid is talking about, it seems to be moving in a Southernly direction. It was NE of Mumbai 1 hr. back, it is right over Matheran now and more in line with South Mumbai. The cloud tops have now touched 18KMs and rain intentsity is back to 100mms/hr. @ Junaid. Panvel might get storm.. Lightening going on South of Badlapur where actual Matheran is located.. Badlapur just having drops falling now. Taking Lightening snap which is going on Matheran range. @ NT.. Yes.. All gone to south now. Badlapur's drizzles to stopped now.Lots of lightening activity in South of Badlapur where actual Matheran is located.. Just now taken one lightening snap which was felling on Matheran range. Will post on Vagaries FB in few minutes. 5 mints back big droplets of rain started at panvel in a drizzly manner,,same like badlapur!! Tomorrow is the final day (8.30am readings) for the official monsoon figures of this year. Total all India today (8.30am) stands at 816mm. We might get another 2-4mm to take the total to 818-820mm. Ofcourse the spillover will then get added to the Oct to Dec rainfall figures in any. Rajesh sir will mail you final monsoon analysis at around 7pm so that you can then post it after perusing for any changes.. 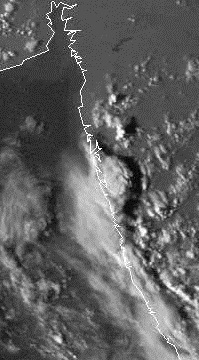 The huge storm in the pic has dissipated to form cirrus clouds with low cirro stratus in the region 50-100kms south of Mumbai. another storm, as readers moitored moved from the NE of Mumbai towards SW of Mumbai, cutting across Matheran and nearby regions. GSB; sure, waiting for the final results. Below expectations . Monsoon has behaved on its own whims every month this season ! Badlapur received just 0.5mm rain. Snap of Lightening striking over Matheran mountain range is posted on Vagaries FB page. Rajeshji - Bangalore did not receive any heavy rains - as forcasted. just few mm - no use for extreme drought. Infact recent UAC,low over western Raj,Guj,Kutch for 10days brought rains over 500mm - a month rain in 10days - tiding all deficiencies. @ Rajesh Sir. As we discussed last night that yesterday too SW Saurashtra had Thundery development near Porbandar -Junagadh Belt. So some Rain data of today ending 8.30am for Saurashtra region. abhijit: Yes, i saw the figures too. They are put up by IMD. But, i'll wait for my recheck..as yesterday, Anjar received 43 mms, that was correct, but it seems the actual rainfall at Bhuj was 24 mms.!! The main thunderstorm activity starts in mumbai by tommorow evening or by monday. today was just a glimpse of wht is abt to take place from next week. Okk. Rajesh Sir.. Today was excited to see Thunder developing but also disappointed as it didn't pour here ! And instead it quickly got disappeared.. But I think Murbad, Barvi dam, Badlapur in NE of Badlapur & Matheran, Karjat in S/SE would have got better spell as per Radar report & also by visual observation from mine place. So lets see an rain amount of that places tomorrow..
As said earlier thunderstorms that we are waiting for , are going to take place now so the countdown begins fro today till thursday. the imd has predicted fairly widespread rainfall activity for maharashta after 3 days!! Nobody is predicting rain for western himalayan region still it is raining there at isolated places ranging from light to moderate to rather heavy.Yesterday Dehradun recorded 7.4mm of rain. correct just few IV drops like rain over Bangalore. Saurashthra,Kutch,west Raj receives 3 times more rain. Marathwada receives 5 times more rain. from tommorow rainfall activity will increase in maharashtra so also the chances of thunderstorm activity in mumbai will increase , also there are high chances of thunderstorm today evening in mumbai. A sudden change in wind direction from tommorow thats is SSW direction is going to bring rains in mumbai temporarily. rainfall was very heavy in bangalore . bangalore is experiencing good rains last few days. wow that means sset will be very happy now , as bangalore is experiencing very good rains.